We are now in Derby which is located on the tidal mud flats on the edge of the King Sound. 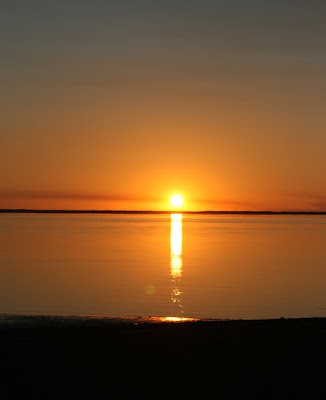 It has the highest tidal range of any port in Australia and one of the highest in the world. Because of the huge range between high and low tide the jetty was built really high. The high tide in Derby can be as high as 11.8 metres, today it was actually 8.2 metres. The town had its origin in the pastoral and mining industries. During World War 11, Derby was bombed by Japanese planes because the airbase and jetty was used by Australian forces. More recently, refugees are housed at Royal Australian Air Force Base Curtain, which is located south of town. Derby has a population of approx. 4,500 people. Half of the population are Aboriginal Australians, with three different Aboriginal languages. There isn't a huge amount to see here but what there is here to see, we are seeing. It's also nice to stay in places where you can just relax around our little camp. 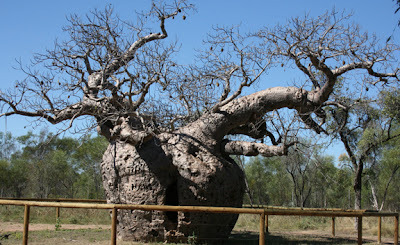 Something that has really grabbed my imagination up here in the north are the amazing Boab trees. The Boab tree is a major feature of Derby. It has been used as a street tree and many of the larger growing natural specimens have been preserved. One such specimen is the famous Boab Prison Tree which is located 7 kilometres from town. This huge tree is believed to be around 1,500 years old and has a girth of 14.7 metres. It was used as staging point for prisoners being walked into Derby in the early days. This tree belongs in Harry Potter or Lord of the Rings. Myalls Bore and Cattle Trough - the bore at this location was first dug in 1910/11. It replaced the original well that was dug in the early 1890's. The water from the bore has a rich mineral content and was reputed to have therapeutic properties. A bath house once stood near the trough. The cattle trough is 120 metres long and was built around 1917. The trough could handle 500 bullocks at one time. 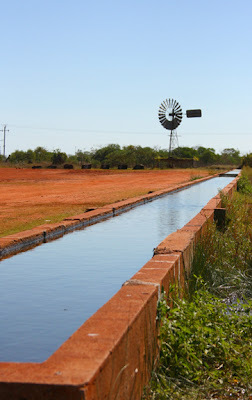 The water is now pumped into the trough by a windmill. This is one big cattle trough! Once again my day was completed by a beautiful Western Australian sunset.